Big gallery at US Amateur on eighth hole. 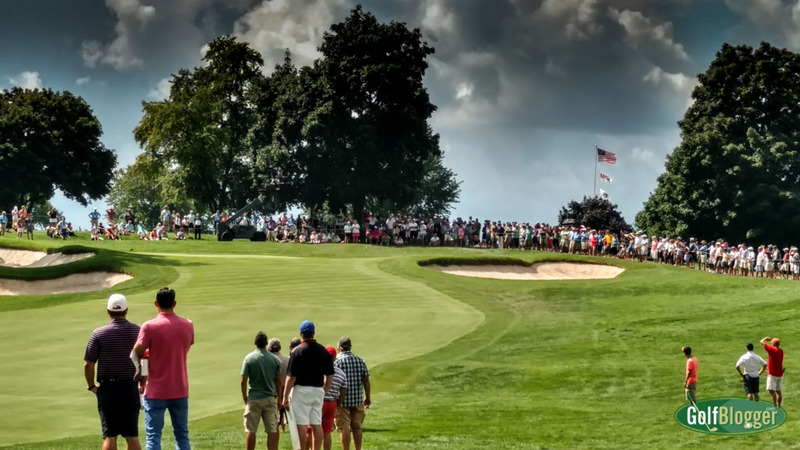 Large crowds were on hand today to watch Michigan’s Nick Carlson advance to the US Amateur Semifinals. Cries of “Go Blue” replaced the usual “Get in the hole” from the crowds. Carlson was down early in the match against University of Illinois junior Dylan Meyer. Although he was trailing from the first hole, Carlson managed to keep the match close enough to mount a comeback. At the turn, he was two down. Then came the rain delay. Dangerous weather threatened, and matches were suspended for forty five minutes. When play resumed, the match turned. Carlson got a hole back on the tenth and another on eleventh to make it all square. Carlson never trailed after that. Carlson won the twelfth to go one-up, then surrendered one to Meyer on thirteen to go back to All Square. Carlson went one-up on fourteen and 2 up on fifteen. Both players got a par on sixteen. On seventeen, however, Meyer three putted and conceded a short putt to Carlson for the match. On Saturday, Carlson will face Curtis Luck, of Australia for a chance to go to the finals of the US Amateur. Carlson and Luck will tee off at 8 am at Oakland Hills Country Club. Parking for the event, with shuttles, is at the Bingham Farms Office Center.